This once-productive placer gold district is located about 87 miles north and west of Santa Fe via paved highway. The Hopewell placers are divided into two main areas: Placer Creek (known as Eureka Creek in the old days) and what’s known as the “lower flat” area. Both areas contain decent water flow for small-scale mining activities. The upper portion of the Placer Creek area contains Hopewell Lake (a popular fishing spot) and a large campground which is typically crowded and that can be unbelievably noisy (“boom boxes” booming and stereo systems blaring, loud partying, assorted and sundry poor campground behavior, etc.) in the summer months. So if you’re expecting a quiet mining getaway here, you may be sadly disappointed. I never camp at this location myself, but just make it a day trip. However, if you’re willing to hike along Placer Creek away from the campground and lake area, you can find some solitude and some decent gold . In past years my son and I have recovered a number of small nuggets from Placer Creek via sniping and sluicing. In the old days of mining here, fairly large nuggets were not uncommon so there is potential for decent finds. I’ve not been to or worked the lower flat area of the Hopewell District, but I know others who have. The placers in this area are less extensive than those found at the upper reaches of Placer Creek, but there is good gold to be found for those in the know. I think (without knowing for certain) that some prospecting and mining clubs may have claims in this area. Anyway, check with the state or the feds or whoever “controls” the Hopewell District before you dip a gold pan in the water there. Perhaps the bureaucrats relented and have ceased applying this idiotic rule…then again, probably not. Also be advised that access to the District’s placers can require a vehicle with off–road potential if you want to get away from the Hopewell Lake campground area. Access to Hopewell Lake and the campground is quite easy, but once away from the campground the unpaved roads or trails can turn to crap in a hurry. This is a good gold area that is only seasonal (the winters can bring very heavy snows here) and that is typically only open from April or May until October. Despite the BS associated with accessing or staying here, the Hopewell District remains one of the few public access, small-scale or recreational mining areas in New Mexico with enough water to do things right. Any articles on alluvial mining in Arizona?? I have an entire series on Arizona gold...use the search function on the right sidebar. "Gold in the Southwest: Arizona." J.R.
the permit is aday pass that can only be got from the forestery office at tres piadres. its free. the creek is only open to prospecting from june 1 through aug 30. Thanks for providing this info and for commenting. Best, J.R. Learn how to use the LR2000, there's a bunch of active placer claims here. Lots of misinformation posted in this article. Besides a short stretch of stream immediately below Hopewell Lake, the rest of Placer Creek is either claimed or private property granted by patented mining claims from the 1800s. The GPAA has 3 claims totaling 280 acres accessible to club members which includes most of the lower half of the stream. 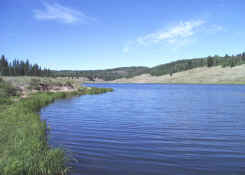 If you're a club member a New Mexico water quality permit is required for using motorized dredges and/or moving more than 2 cubic yards of material, if either applies then you also need Forest Service authorization which can be obtained at the district office in Tres Piedras, one reason is to make sure different dredging operations are the proper distance apart, 50 yards. You don't need a permit for casual use panning and and using non-motorized sluice if you're moving less than 2 cubic yards. Whether or not you're a GPAA member the rest of the stream almost to the lake is covered by active and private claims and prospecting isn't legally allowed without permission from the claim owners. Well thanks for the corrections .